Because it is important to treat broken bones immediately — especially in children — you should know how to recognize the symptoms of a fractured arm. They include severe pain, swelling, bruising, deformity such as a bending or shortening of the arm, and the inability to rotate the arm from palm up to palm down or vice versa. If you suspect you or your child has a broken arm, seek medical attention immediately to prevent further damage and improper healing. Three bones make up the bone structure of the arm. The forearm consists of the ulna and the radius. The upper arm consists of the humerus, which extends from the shoulder to the elbow. A break to the forearm usually results from a direct impact on the bones or a fall onto an outstretched arm. Such an impact may break either or both the ulna or radius. The humerus can also be broken by a significant blow to the upper arm, though this is less common. Breaking either the forearm or the humerus will limit the normal range of motion. A break to the bones in the forearm will make it painful or impossible to rotate the arm. If you suspect you have a broken arm, seek medical attention immediately at your primary care physician, an urgent care center or the emergency room. This is especially important for children since their bones heal more quickly, and delaying treatment may complicate proper healing. When faced with fractured arm symptoms, you will need to be treated as soon as possible. 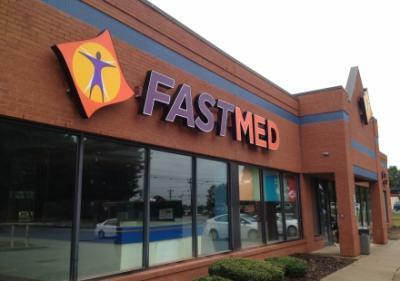 All FastMed Urgent Care locations are open seven days per week and have extended hours, so we’re here when you need us. Our state-of-the-art facilities are equipped with digital X-ray machines that can analyze a broken arm in minutes, and our medical professionals can set and immobilize the arm immediately to ensure proper healing.